NYCDailyDeals -- What's Free And Cheap In New York City Today: Boo! Free Haunted House Tickets To "Nightmare: Superstitions"
Boo! 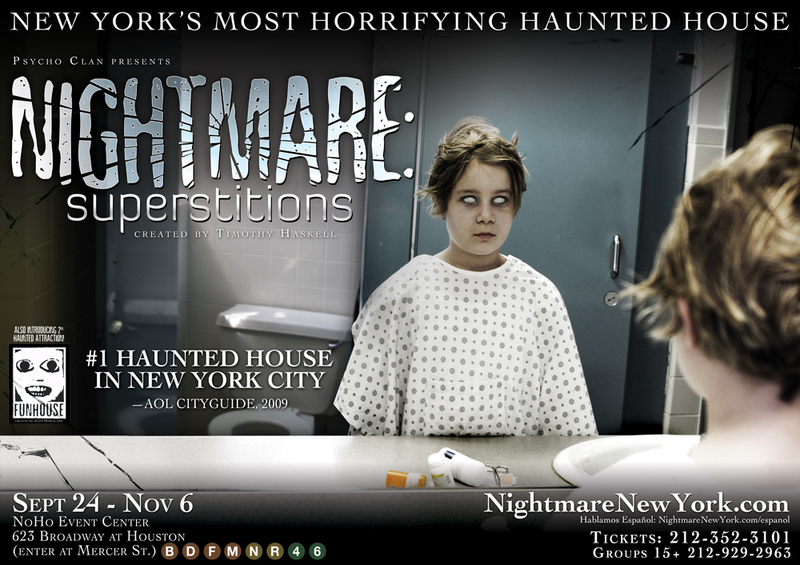 Free Haunted House Tickets To "Nightmare: Superstitions"
Nightmare: Superstitions is a unique, fully immersive haunted house experience celebrating its seventh year spooking out New Yorkers. Set in an insane asylum, the attraction is known to delve deep into the psychology of fear. Scared yet? Today we have an exclusive discount code you can use to purchase tickets + a chance for you to win your way in for free! To purchase tickets, click here. A $5.00 discount on general admission tickets, a $15.00 discount on VIP tickets, and a $20.00 discount on super VIP tickets will automatically be applied at checkout. If purchasing tickets it too scary, we have five pairs of tickets to give out to some of our Twitter followers. First -- make sure you're following @nycdailydeals. And then simply send out a tweet about the most scared you've ever been! Include #nycdailydeals at the end of your post and we'll pick five of our favorite tweets at the end of the day. Discount code not valid on 10/22 - 10/24 and 10/29 - 10/31.